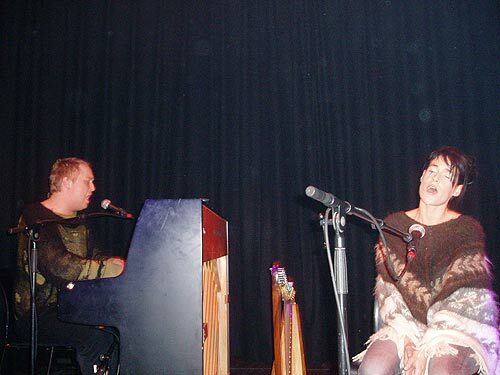 My first musical encounter with Antony and the Johnsons was when I saw him perform as support-act for Current 93 in London. David Tibet is not the only one who is charmed by this androgynous singer with the dramatic songs from New York. Antony has recently also collaborated with Lou Reed. 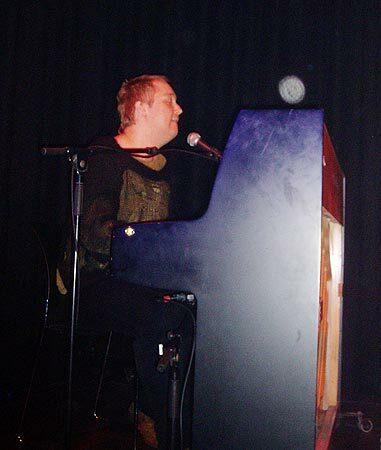 Last week Antony played in the intimate upper room of the Paradiso venue in Amsterdam. It was not clear if Antony would do a solo performance or that he would be accompanied by his Johnsons. Also the site of Paradiso first announced that the French musician Colleen would also perform, but that (unfortunately) appeared to be not the case. 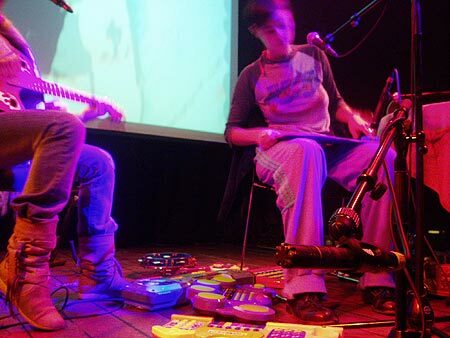 Apart from Antony the original female duo Cocorosie would also play on this Sunday afternoon. This act seems to get some media hype recently, so I assume quite some visitors came for Cocorosie. Antony, dressed very casually in a ragged old black sweater, took place behind the piano to do a short solo performance. He hesitated which songs he would play. Antony was not in the mood for miserable songs on this afternoon, but flipping through his book of lyrics he concluded that he had only depressive songs to play. He seemed to be a bit shy when the audience treated him to a warm applause after each song. Antony started to play his ‘hit’ Cripple and the Starfish, but stopped after a few notes, stating he was not in the mood, to the disappointment of the visitors. He did play the over-the-top dramatic ‘I fell in love with a dead boy’, as well as some new songs like ‘The lake’. With just the piano and his sentimental voice Antony managed to get the audience quiet for half an hour. In between he told various anecdotes about the year he lived in Amsterdam, when he was seven years old, ‘still the best year of my life’. For the encore he called the help of Cocorosie member Sierra. It took some time before she was found in the dressing room, but finally she could support Antony with some backing vocals. It was a short but moving performance. After this Cocorosie took the stage. This band from Brooklyn consists of Bianca and Sierra Casady. On some songs they were supported by a guy playing additional percussion. 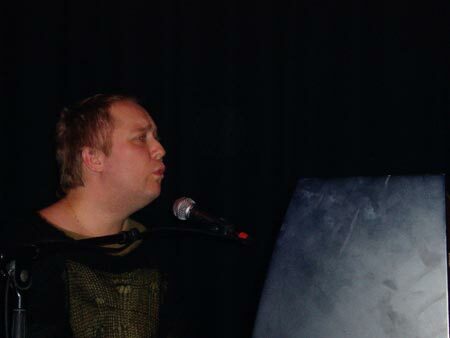 Also Antony lend some piano and vocals on a few tunes. 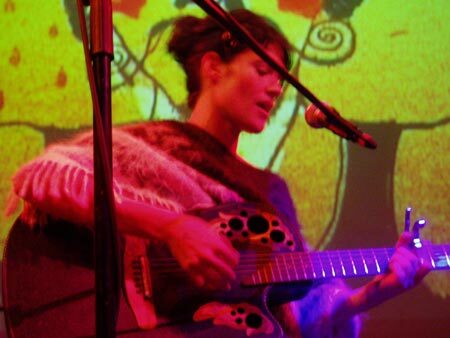 Cocorosie has received critical acclaim for their debut album `La Maison de Mon R?ve` and especially the song `By Your Side`. I was not very familiar with their work, I only listened to some mp3’s in advance, but I enjoyed their concert. 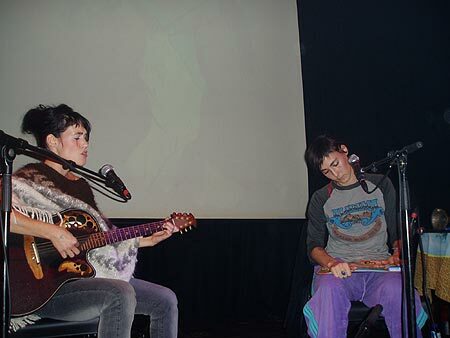 The performance of Cocorosie was certainly original. Sierra, who has a background in opera, plays classical instruments, like flute, piano, guitar and harp. She also has a very nice voice. Bianca on the other hand more has a peculiar voice, which reminds me of authentic pre-war blues records. Very funny are the ‘instruments’ she plays: all kinds of children’s toys, plastic keyboards and drum pads, toy cars which make noises, simple memorecorders, everything which is cheap and makes a noise. 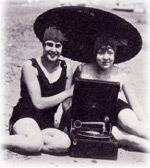 But it is not just a gimmick, for some reason the two girls manage to make consistent music. There were also nice drawings and pictures in the background to enhance the atmosphere. Their music is hard to describe: there are clear elements of blues, gospel (‘Jesus loves me’), jazz (reminding of Billy Holiday), trip-hop, with a lo-fi, improvised character, so that the seemingly traditional styles get a raw, original sound. An entertaining act to see live.